Or view larger version. The Progress of America. ca. 1875. Domenico Tojetti, artist. Oil paint on canvas. Collection of Oakland Museum of California, Kahn Collection. Italian born artist, Domenico Tojetti, settled in San Francisco, California in 1871. Painting in a style reminiscent of churches on Rome, his painting, The Progress of America, is an allegorical scene, probably prepared for the Centennial. 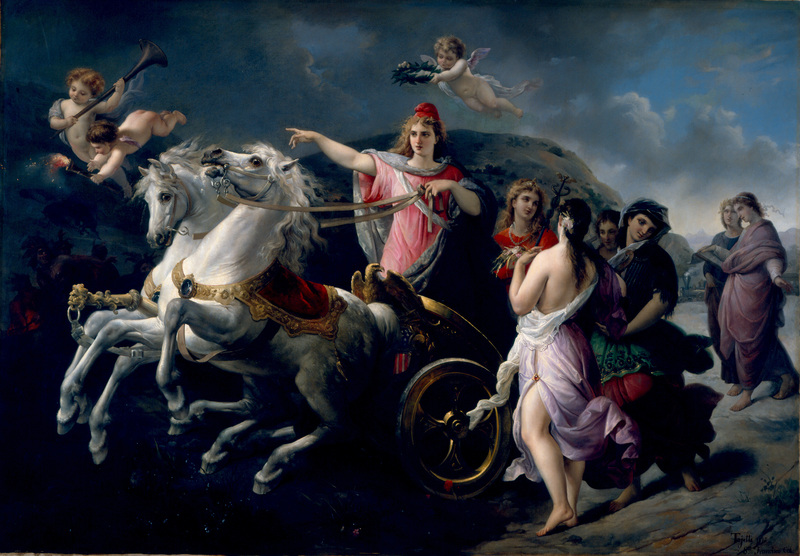 It depicts “America” as a maiden in a chariot followed by the muses of Art and Science, while bison and Indians flee before her westward advance.